One of the most important skills that every teacher must acquire is classroom management. However planned a teacher might be, she rarely gets the environment she may have envisioned when entering a class. Effective teaching-learning can happen only when both the teacher and the students are ready for it. The environment of the classroom should be conducive for learning to take place. Every classroom has a varied group of children from diverse backgrounds with their individual interests, strengths and weaknesses. Some want the teacher’s attention while others shy away from it. So, how does a teacher tackle so many students? She also has to accomplish the task in hand, complete her lesson plan, get the activity done and achieve the objectives of the lesson being dealt with. Now, this is when good classroom management skills work wonders. Good communication skills, having a set of rules for the class, organized and resourceful, having a silent corner in class, taking help from the disruptive lot, being vigilant and active all the time are a few tips that can help in making classroom management easy. The teacher must have a set of rules laid for the students in the classroom right at the beginning of the session. These rules must be laid by discussion and mutual consent of the students and the teacher. Also, the teacher must clearly spell out the kind of behaviour she expects from her students. What is acceptable and what is not should be conveyed in a respectful but assertive way. A regular rotation of seats in the classroom helps the students mingle and interact with everyone in the classroom. Also, it helps break up the mischievous group of students. The teacher can also think of an arrangement according to the activity she wants to carry out in her class but this must be done before the lesson begins so that teaching time isn’t sacrificed. At times, students who are quick to finish a task tend to be disruptive in class. Such students can be paired with the ones who often need help to accomplish a task. This also leads to peer learning. The teacher must ensure that she always enters her class well-prepared. For this, it’s necessary to plan in advance. All the resources she needs in the class should be procured beforehand. Always have an extra set of worksheets or an activity planned for the students who are quick to finish the task given to keep them occupied. It’s good to begin the class with a breathing exercise to bring all the wandering minds back to the class focussing on what you want to communicate so that you can carry forward your lesson from thereon. Discipline acquired in school becomes a student’s way of life. Students must be encouraged to be disciplined and follow the rules laid in the class. It’s good to appreciate the ones who are disciplined as this motivates everyone to follow good conduct. 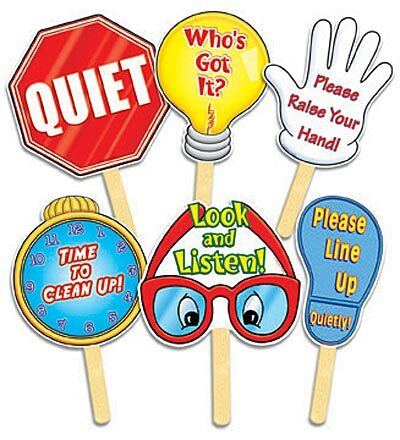 During classroom discussions, talking stick puppets (which act as permission to speak) can be used to avoid everyone speaking at the same time. Students should be rewarded (say in the form of points to the individual student or their house) for listening to others too. The importance of listening has to be highlighted as nowadays everyone wants to be heard but nobody wants to hear what others have to say. This will help the teacher manage the class well. The conduct of the teacher too has a vital role to play. The teacher can’t just instruct the students to follow a particular kind of behaviour. She has to live it as she is a role model for her students. It goes without saying that she has to behave appropriately at all times. This also means that she has to show respect to her students, lend a compassionate ear, and address their issues with kindness and concern. She must make eye contact when communicating with the students as this builds trust and bonding between the teacher and the taught. The communication and instructions given by the teacher should be clear and precise. The teacher has to be active and stay engaged at all times so that each child gets the attention and time he/she deserves. Punishment, if any, should be positive and not hurting the self-esteem of the child at any point. A teacher should never bring any sort of humiliation to the students whatever the circumstances may be. Just to ensure that discipline is followed, have a silent corner in the class. The most disruptive child can be sent there (if necessary) where no one interacts with him depriving him of his friends and the fun of participating in the activity being held in the class. He can also be given some extra work such as an extra handwriting page or solving math problems which will polish his skills while making him realize the importance of good conduct in class. Some children in extreme cases need to be counselled too. If a teacher is unable to accomplish a task in class, she must try and find the cause for it so that she can find ways to improve the situation in class. I would like to conclude that teaching is a profession meant only for those who have compassion for children and passion for teaching. We as teachers can’t be unkind to the students at any point of time as we touch lives with our words and actions and make a lifelong impact on them. I believe that any amount of bad behaviour can be tackled well by having patience and showing kindness and affection towards the child. Remember, we want to get rid of the bad conduct of the child and not his happiness. So, the next time you have an unmanageable class introspect and find the cause. If you find the cause, you will find a solution too! The author teaches primary science at the Learning Paths School, Mohali. She is a trained Montessori teacher and has received the Shantanu Prakash Excellence Award for the best facilitator in 2014-15.